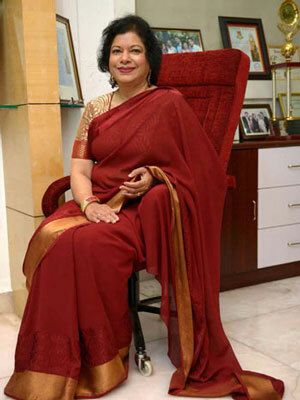 Dr. Daphne Pillai is the Chairperson of the Management Board of Mahatma Education Society (www.mes.ac.in) and Co-Founder of the Pillai Group of Institutions. The Society today manages a total of 48 educational institutions spread over six elegant campuses, providing quality education from kindergarten to post-graduate professional courses in the faculties of Engineering, Architecture, Management, Teachers Training, Arts, Science and Commerce to more than 30,000 students with 2000 teachers and 1500 members of non-teaching staff. Dr. Daphne Pillai holds a doctorate in English Literature from Mumbai University. She is the Campus Rector of Dr. K M Vasudevan Pillai Campus Panvel. She was the Principal of Pillai College of Arts Commerce and Science, Panvel from 2002 to 2017 during which the college won various accolades in the areas of academics, sports, art and culture. She, along with her husband, Dr. K. M. Vasudevan Pillai, had the honor of being invited as a part of the Prime Ministerial business delegation at the BRIC-IBSA summit in Rio-de-Janeiro in April 2010. She has attended the Masterclass for Directors which is a Training and Orientation Programme for Corporate Directors and Senior Executives and has received the Certified Corporate Directorship certificate. Dr. Daphne Pillai is the Founder President of Soroptimist International Bombay Chembur (SIBC), affiliated to Soroptimist International; a women’s organization which has consultative status in the United Nations. She has been invited to international forums in USA, Turkey, Portugal and United Nations to speak on the various issues and challenges faced by women in India. Dr. Daphne Pillai was awarded the SI-Achiever Award by National Association of Soroptimist International in December, 2012 for her exemplary work in the field of women welfare and development. She was also the recipient of the Savvy Honors Celebrating Success Award in 2016. She was selected to represent the Federation of Soroptimist International of Great Britain and Ireland (SIGBI) at the United Nations Commission on the Status of Women (CSW 62) at the United Nations Headquarters in New York in March, 2018. She was elected as President of The International Women’s Federation of Commerce and Industry (IWFCI), India Chapter in August 2018.